The Douglas AIR-2 Genie (previous designation MB-1 and also known as the blivet) was an unguided air-to-air rocket with a 1.5 kt W25 nuclear warhead. It was deployed by the United States Air Force (USAF 1957–1985) and Canada (Royal Canadian Air Force 1965–68, Air Command 1968–84) during the Cold War. Production ended in 1962 after over 3,000 were made, with some related training and test derivatives being produced later. Plumbbob John nuclear test, the only live test ever of a Genie rocket, on 19 July 1957. Fired from a US Air Force F-89J over Yucca Flats, Nevada Test Site at an altitude of ~15,000 ft (4.5 km). The interception of Soviet strategic bombers was a major military preoccupation of the late 1940s and 1950s. The revelation in 1947 that the Soviet Union had produced a reverse-engineered copy of the Boeing B-29 Superfortress, the Tupolev Tu-4 (NATO reporting name "Bull"), which could reach the continental United States in a one-way attack, followed by the Soviets developing their own atomic bomb in 1949, produced considerable anxiety. The World War II-age fighter armament of machine guns and cannon were inadequate to stop attacks by massed formations of high-speed bombers. Firing large volleys of unguided rockets into bomber formations was not much better, and true air-to-air missiles were in their infancy. In 1954 Douglas Aircraft began a program to investigate the possibility of a nuclear-armed air-to-air weapon. To ensure simplicity and reliability, the weapon would be unguided, since the large blast radius made precise accuracy unnecessary. The resultant weapon carried a 1.5-kiloton W25 nuclear warhead and was powered by a Thiokol SR49-TC-1 solid-fuel rocket engine of 162 kN (36,000 lbf) thrust. It had a range of slightly under 10 km (6.2 mi). Targeting, arming, and firing of the weapon were coordinated by the launch aircraft's fire-control system. Detonation was by time-delay fuze, although the fuzing mechanism would not arm the warhead until engine burn-out, to give the launch aircraft sufficient time to turn and escape. Lethal radius of the blast was estimated to be about 300 metres (980 ft). A live Genie was detonated only once, in Operation Plumbbob on 19 July 1957. It was fired by AF Captain Eric William Hutchison (pilot) and AF Captain Alfred C. Barbee (radar operator) flying an F-89J over Yucca Flats. Sources vary as to the height of the blast, but it was between 18,500 and 20,000 ft (5,600 and 6,100 m) above mean sea level. A group of five USAF officers volunteered to stand hatless in their light summer uniforms underneath the blast to prove that the weapon was safe for use over populated areas. They were photographed by Department of Defense photographer George Yoshitake who stood there with them. Gamma and neutron doses received by observers on the ground were negligible. 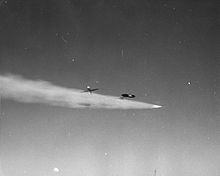 Doses received by aircrew were highest for the fliers assigned to penetrate the airburst cloud ten minutes after explosion. The Montana Air National Guard F-89J that launched the live Genie. The Genie was cleared to be carried on the F-89 Scorpion, F-101B Voodoo, F-106 Delta Dart, and F-104 Starfighter in U.S. service. A trapeze launcher was fitted beneath a Starfighter, but it was never carried in operational service. Convair offered an upgrade of the F-102 Delta Dagger that would have been Genie-capable, but it was not adopted. Operational use of the Genie was discontinued in 1988 with the retirement of the F-106 interceptor. The only other user was Canada, whose CF-101 Voodoos carried Genies until 1984 via a dual-key arrangement where the missiles were kept under United States custody, and released to Canada under circumstances requiring their use. The RAF briefly considered the missile for use on the English Electric Lightning. Safety features included final arming by detecting the acceleration and deceleration of a fast aircraft at high altitude. The weapon was built too early to use a permissive action link security device. 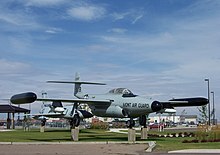 The F-89J that was used to launch the only live test is on static display at the Montana Air National Guard in Great Falls, Montana. Wikimedia Commons has media related to AIR-2 Genie. ^ "Five at Ground Zero". CTBTO. 19 July 1957. Retrieved 17 February 2014. ^ Attachment 12. Preliminary report. Operation Plumbbob. Nevada Test Site, May-September 1957. Project 2.9 NUCLEAR RADIATION RECEIVED BY AIRCREWS FIRING THE MB-1 ROCKET. ^ "McDonnell Douglas Air-2A Genie Rocket." National Museum of the United States Air Force. Retrieved: 9 August 2015.